Matthew J. Angiulli, Attorney - Martin|Hild, P.A. Mr. Angiulli provides legal services to clients engaged in the construction industry ranging from local subcontractors to national contractors. Prior to law school, Mr. Angiulli worked as a project engineer for a construction management firm on a variety of education and governmental projects throughout Florida. 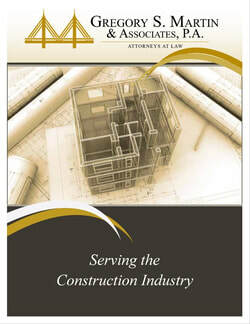 Having an educational background in construction management and years of experience in the field, Mr. Angiulli combines his personal and professional knowledge in construction to analyze client matters that are unique to the construction industry and assist clients in construction contract drafting and dispute resolution. Mr. Angiulli is versed in developing claims for complex construction projects.